Learn how to make Easter salad recipes for a lighter side of the holiday foods. Most of us usually have candy, cookies, cakes and sweet rolls in our homes for Easter. On top of all these snack foods, we will have a hefty Easter dinner menu so it is nice to offer also some light refreshing salads. These could be vegetable salad, fruit salads or even light dessert salads; just giving our diners some lighter options. When I learned how to make Easter salad recipes, I learned the success depends much on the eye appeal of the presentation. Whatever type of salad you make, it should be a blend of colors with some contrasting color to enliven the eyes of your guests. I read somewhere a long time ago that salad ingredients are carefully placed together like a painting or artwork. For this display of “artwork” choosing the right salad bowls and plates are an important part of the presentation. For Easter and other holiday dinners, I prefer most salads served in or on crystal or nice glass. The hues of green and other colorful ingredients manifest through the glass calling attention to the salad being presented. I learned a “rule” many years ago from some of the Disney restaurants which I always practice when I prepare a salad; prepare fresh salad ingredients in “bite sizes only”. I really hate ordering a salad in a restaurant when the pieces are too big to eat; most of the time there is not enough room in the small bowl to cut them. If you are learning how to make Easter salad recipe, blending lettuce and other greens makes a nice presentation. These greens range from very mild types to some sharper flavors. By combining a few of these greens, the mild and sharper flavors offer a great slightly tangy taste to your guests. You could add a little shredded red cabbage to a bowl of mixed greens as a pretty accent. There are many ingredients which can be added to your Easter salad recipes besides the cabbage or in addition depending on your likes. Various types of nuts give salads a lot of crunch, grated cheese, croutons and anchovies are some ingredients that are popular with diners. Vegetables of contrasting colors are often added to green salads for eye appeal; tomatoes, carrots or radishes. Easter salad recipes can be made very special by only adding a little fruit to the greens. Pineapple, strawberries, raspberries or peaches add a little sweetness to greens plus the color enhancement. Quite often the juice or puree of these fruits is incorporated into vinaigrette to marinate the salad ingredients producing a very delicious tasting salad. Congealed salads are really popular Easter salad recipes. These molded salads make a beautiful presentation for Easter, any holiday or special occasion. The diversity of ingredients which can be used in these salad recipes can fit into any persons taste buds. This is a nice Easter salad recipe if you are having a crowd; it feeds about 12 people and the layering makes a pretty presentation. Assemble salad in layers beginning with a layer of iceberg lettuce. Drain relish and place a layer over lettuce. Top relish with tomatoes and dollops of feta dressing. Continue layering until all is used. Toss first 7 ingredients of relish in large mixing bowl suitable for marinating. Combine next 5 ingredients in a jar; cover and shake well. Pour jar contents over relish; marinate in refrigerator for 24 hours. Combine and mix mayonnaise, dressing mix, sour cream and buttermilk. Add feta cheese and refrigerate 24 hours. Cut off tough ends of asparagus and wash. In large saucepan bring to a boil 1 ½ quarts water; add asparagus and cook 1 minute. Drain and plunge asparagus into cold water until thoroughly chilled; drain well. Cut asparagus into 1 inch pieces. Combine and mix in a bowl soy sauce, sesame oil, vegetable oil, vinegar, pepper and onion powder. Toss asparagus with sauce just before serving; serves 6. This congealed salad recipe makes a pretty presentation as one of your Easter salad recipes or for any special occasion. Squeeze as much liquid from the spinach as possible; place in medium bowl. Combine gelatin and water in a small saucepan; stir well and let stand 3 minutes. Stir gelatin mixture over low heat until gelatin dissolves. Stir in bouillon cube until dissolved; set aside to cool. Pour gelatin mixture over spinach and stir to combine. Place undrained sardines in a bowl and mash with a fork. Stir sardines into spinach mixture and stir to blend. Fold in sour cream, chopped eggs, salt and pepper. Rinse decorative mold with cold water and drain; spoon mixture into mold and smooth top. Refrigerate for several hours until mold is firm. Insert knife around edges to loosen; invert on serving plate. Wet hot towel and place around bottom of mold to loosen. Cut cheese into 6 slices; place in 8 inch square dish. Cut tomato into 6 slices; place on top of cheese. Slice zucchini into ¼ inch slices; arrange in dish. Combine remaining ingredients in jar with lid; shake well and pour over zucchini. Snap off and discard woody bases from asparagus. Cut asparagus in 1 inch pieces; microwave with 2 tablespoons water covered for 5 to 7 minutes. Drain asparagus and cool with cold water; let set in cold water until cold and drain. In medium bowl stir together poppy seed dressing, orange peel and orange juice; set aside. 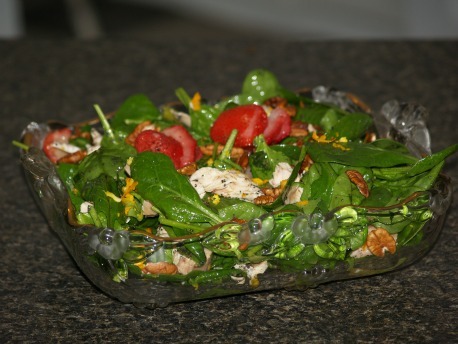 Combine in salad bowl asparagus, spinach, berries and chicken; add dressing and toss. Tear lettuce into bite size pieces; toss with remaining salad ingredients. Combine all of dressing ingredients and mix well; chill. To serve shake dressing again and pour over salad; toss salad to coat and serve.